Win a trip to Beverly Hills and entry to GTCon Courtesy of Gi Automotive Group! GI Automotive Group is excited to announce an incredible contest for women who want to learn how to create a career in automotive! One lucky girl will be selected to receive a round trip flight to Los Angeles, three days accommodations in Beverly Hills and the opportunity to accompany the Gi Automotive team, Angie Mead-King and Amber Blonigan, to GTCon! 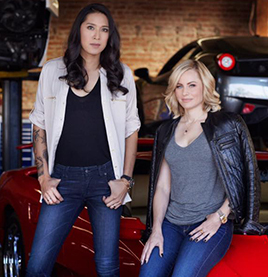 During the three day visit to Los Angeles, Angie and Amber will also assist the winner with other career related opportunities in the automotive world. Who can win: Women 21 and older located in the United States or Canada. Sorry boys, this contest is for females only, we will have other fun things for you to do at the show! How to win: Girls, in 500 words or less, tell us a little about yourself, whatyou would like to do in the automotive industry and why you feel you should win! Email your entry to gi@gtcon.com with the subject line GTCon Contest. We want to hear your story! Email your entry to us before April 21, 2017 for your chance to win a trip to Los Angeles, entry to GTCon and three days with Angie Mead-King and Amber Blonigan.